Last year’s Grand National fourth Blaklion will return to action this weekend and return to the familiar surroundings of Wetherby. He has run three times over the chase course at Wetherby, winning there as a novice before finishing fourth in the Charlie Hall, the race he will run in at the weekend, and third in the Rowland Meyrick. At just eight years old and after a great run to come fourth last season, he is many peoples idea of an early fancy for the big race in April, so many will be watching how he runs. 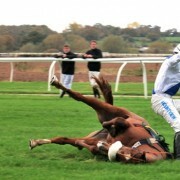 He is likely to need the race and will strip much fitter next time out after this race. That next run could be over the big Grand National fences in the Beecher Chase according to trainer Nigel Twiston-Davies. That would be a great preparation run for his national bid, and one that would confirm that is the route his trainer and owner wants him to take. This time last season, Blaklion went into the Charlie Hall Chase as a potential Gold Cup horse and he was fancied to win the race despite it being his reappearance run. 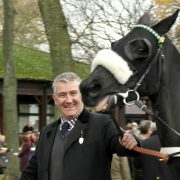 Things did not go to plan for him and he only came 4th, which ended any realistic hopes of him being a Gold Cup horse. However, his staying ability and the way he jumps led Twiston-Davies down the route of the Grand National, and that looks to be what he will attempt to win over the next few seasons. 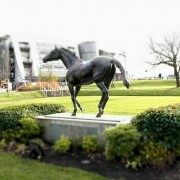 He looks to be the ideal horse for the race, and at just eight years old, he has many miles left on the clock. 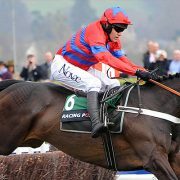 With great jumping ability, stamina in abundance and a great temperament he looks to be the ideal Grand National horse and it is no surprise to see him either favourite or close to the head of the market with the bookmakers. While this weekend we may not see a fully fit Blaklion, it is still important to see how they get on at the start of a new season. I am expecting everything to focus on the Grand National this season, and we will see him slowly build his fitness up until he is 100% ready on the day. That means he probably will not be a betting proposition until Grand National day and the camp will see anything he does before then as a bonus this season. We are beginning to see the Grand National contenders reappear this season and Blaklion is one of the most exciting horses we have seen so far. Following a very good run last season, he will be at the top of many lists this coming season I am sure. Although I do not expect to see him win the Charlie Hall on Saturday, I will be watching how he runs and hoping to see signs that he is back as the same top class horse that we saw last season.